This project began as an amateur manhwa on Naver, but became popular enough that Naver chose to turn it into a professional work. The author and artist changed their pen names—from TieRo to Mirchi and Muchi to Yamchi, respectively—and restarted the series from the beginning, redesigning the artwork and part of the storyline in the process. The pace is kind of too slow at the start, but you will be rewarded if you continue reading it. This webtoon has a fresh story. All characters are noteworthy and their past is slowly (too slowly!) being unravelled. There is a thin line that distinguishes the good from the bad characters. You have so many questions about their backstories and about what is going to happen in the next chapter that it is difficult to stop reading. Also, there are so many elements that are present in this story; You have vampires, zombies, succubi, werewolfs and ghosts, all living together. You also get magic and special abilities. All in all, this webtoon is a good choice for those that like mysteries packed with supernatural action. Then this is your story which i highly recommend you! This manwha follows Alfen Lark's life who was all the being bullied because of his eyes and physically harmed and even his parents don't care about him. 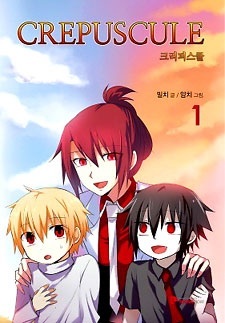 One day he meets Setz a mysterious boy who has the same eyes like him and ask him if he is a vampire too. Setz become his friend and they met everyday then. One day Lark said that he might can't come to meet him ever again because he may have to go to an orphanage. Although he is a vampire he invites Lark to his world because he knows that he can live happily here because there everyone has crimson eyes. Lark finally agreed to go to the other world but he was left alone again. There he meets Angela who instantly finds out that he is a human, but she protect him. They start living with each other. 10 years passed and Angela told to Lark that he has to go to a school and what a surprise he intends to go the same school where Setz is also going. I am very satisfied with the art. The characters looks incredible good and the magic and other stuff are just amazing! And what's even better that every chapter is colored! So yeah Yamchi did a really great job with the art. Lark: He is a human with red eyes and when he was small he often got bulled and physically harmed because of that. He is a very happy person who always smiling even though is cruel background. He is very kind to everyone, but he has a fear that other may actually find out that he is a human and they might kill him. As the story develops he gets more and more friends and he slowly loses this fear. Setz: He is a pureblood vampire. He was the one who brought Lark to this world. When he was small he was very happy and he was always smiling but he had a huge personality change comparing to his childhood. He became a very serious man who never smiles and he is very cold. This manwha is very enjoyable although it has more than 150 chapters, but if you have some time you have to watch it. You will have a really good time while reading it. I'm sorry, but I cannot finish this for the life of me. Every second I read it I feel like stabbing a pencil through my jugular. It just drags on and on, going absolutely nowhere. Ever heard of the "one step forward, two steps back" mentality? Yeah, that applies to the plot of Crepuscule. The worldbuilding is fantastic. Especially in the beginning, it just hits you all at once. All the characters, like Setz and Lark, initially amazed me (sometimes with their stupidity). The characters were developed, the plot expanded, conflict introduced, all that good stuff. The problem is how annoyingly long the development took. It was over 100 chapters before a major part of the plot was introduced. A conversation could take 10 chapters. Moving from point A to point B could take 5 chapters. If all the filler was taken out, Crepuscule would be reduced by half. Depending on how patient you are, this is worth it. The plot is unique and contains things that you would never even guess at. The characters will stick in your head for a while. But if you cannot stand insanely slow development, stay away. After having re-re-read this, my first half-assed review is getting an overhaul. The story can be considered something of a typical supernatural/fantasy manga or anime. The protagonist is sucked into another world, one that's filled with supernatural creatures, such as succubi, vampires, and in this case, zombies. In most of the fantasy manga i've read, the protagonist is sucked into the new world against their own will. This time, the MC, Lark, went by his own will. I love the art, so this part of my review is incredibly biased, but hey, it's my review. The panels are filled with vibrant colors, and I especially love the uses of vibrant shadings. The characters are also well-drawn, and the actions scenes aren't that shabby either. The characters are definitely one of the stronger points of this manhwa. As I stated before, they're drawn pretty damn well, as even the side characters stand out. The colors definitely help, and again, i'm a sucker for the art. But the development of the characters is great. Lark, the protagonist, has a slight fear of being abandoned, as he was left behind by Setz, albeit not on purpose. I could go on and on about the characters, but i'll refrain from that. Yeah, i think all this kinda speaks for itself. I love this manhwa, and i think it deserved morre popularity, even if i am incredibly biased. Crepuscule : Will Lark Alfen be human with no power again?